2 by 3 Heroes: Brought to you by the letter "A"
No, not THAT letter "A". 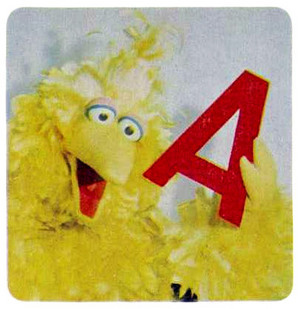 I mean the letter A in regard to the mailers I will be showcasing today. One from Adam over at Infield Fly Rule and the other from AJ from The Lost Collector. Adam up first. I scanned these two for one reason - how crappy they would look. The 90's never though about scanners or cameras. Both are nice new additions to my collection. MINIS! 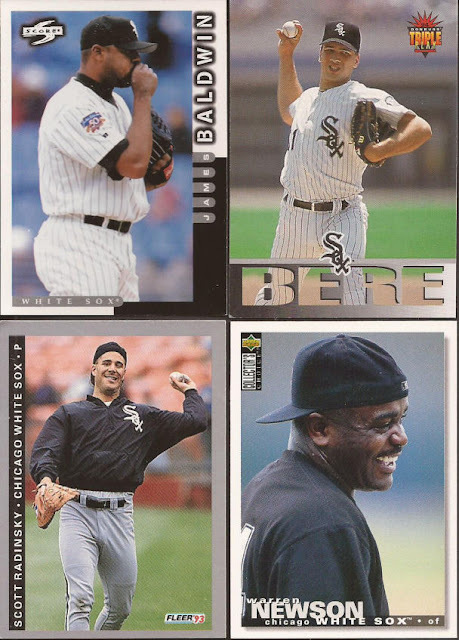 Alexei hit the throwback binder. And I did not have the full sized Eaton for the player collection. Not sure where Adam has such a large stash of 90's junk wax, but I benefited from his generosity. Lots and lots of team set holes were filled. Couple flame outs in in the Fernandez and Alvarez., both with arm issues. Alvarez did toss a no-no in 1991, and was part of the famous White Flag Trade in 1992. Continuing the junk wax dump were loads of bunting cards. I lost track at how many made it into the binder, but here is a sampling. Favorite of the bunch? Uribe at the lower right. Coiled up, just waiting for the ball. Appreciate the mailing, Adam. 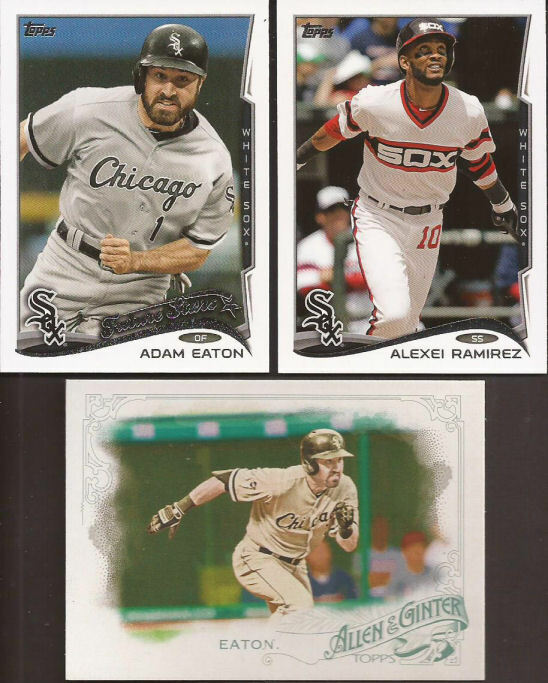 2016 Topps from AJ? Who cares? Me, that's who, because I am still short the Update cards from the team set. These 5 leave me 4 or 5 short of closing the tab on the want list for 2016. 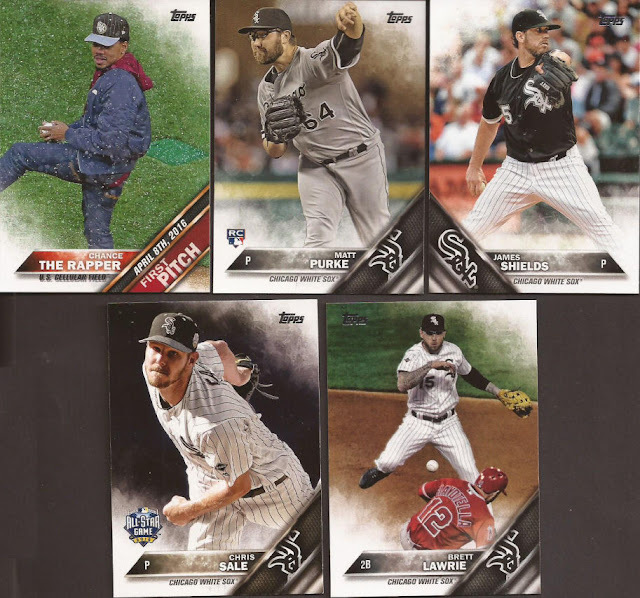 How many Grammy winner cards are in any Topps baseball set? I am sure there are a few more in the First Pitch group (Eddie Vedder comes to mind). More glorious junk wax. Someone forgot to focus on the Baldwin. Maybe that was a left over photo from 1981 Fleer. 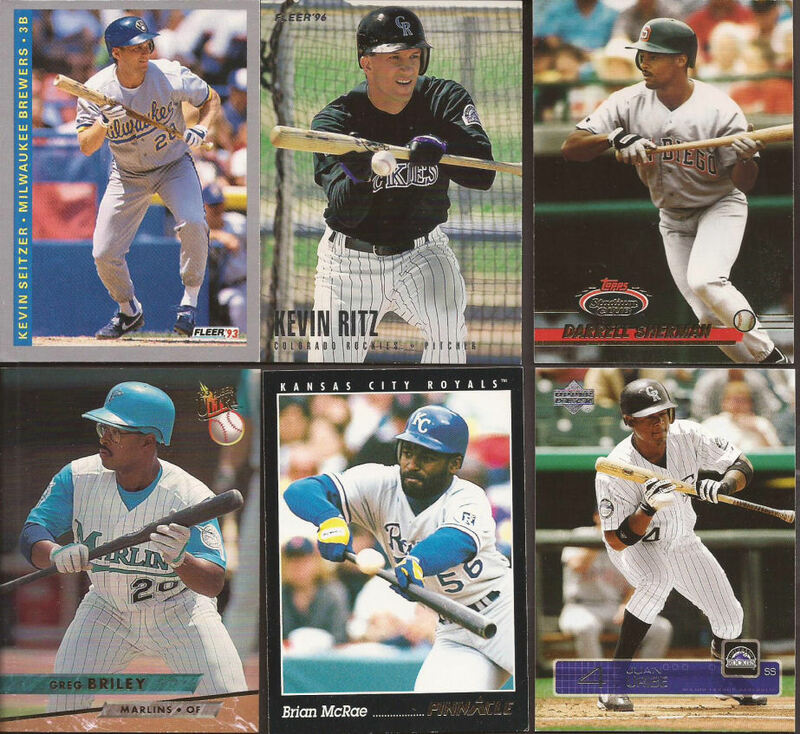 I like how Radinsky and Newson are channeling their inner Griffey, Jr.
Notice Beckham's sleeve. 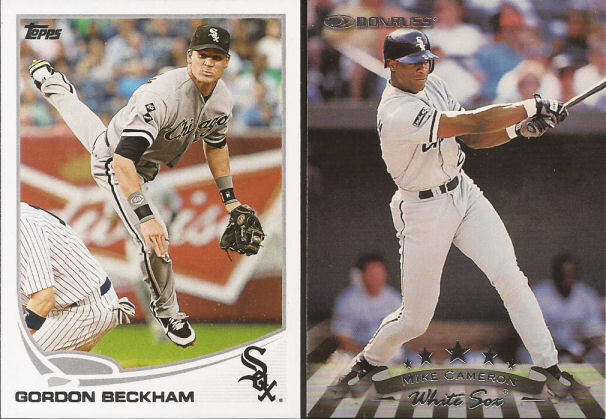 The standard for the White Sox over the past few years is a black diamond with either the player's number, or initials/nick name of the deceased. Even a former owner got just a black diamond, albeit with a gray border. Nellie Fox passed back in 1975. 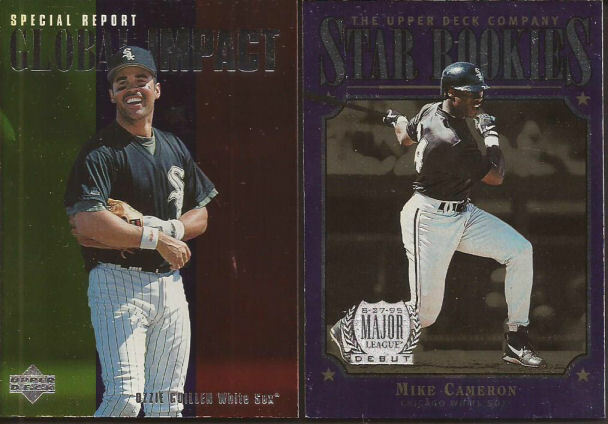 When he was inducted into the HOF in 1997, the Sox wore the special patch you see on Cameron's sleeve. Interesting, as Frank Thomas never got a special honor in 2014. Speaking of Beckham, this is my first bat relic of the former second baseman. 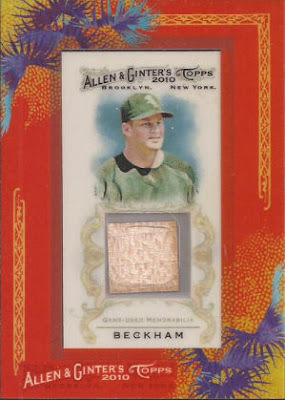 Though, he is listed as a "star shortstop" on the back, a position he played a grand total of 0 times prior to this card, and only 24 times since this card came out. A rare, rare mistake by Topps. (snark) Thank you so much for all the cards, AJ. I didn't notice that with the Beckham. That error must be worth a fortune. I always liked that Radinsky card from 1993 Fleer.